TORONTO, ONTARIO--(CCNMatthews - Jan. 3, 2007) - ANDINA Minerals Inc. (TSX VENTURE:ADM)("Andina") is pleased to announce the first results from it's 40,000 metre, Phase III Volcan Gold Project exploration program which commenced in late October 2006. The first set of assay results, which are summarized in Table 1 and Table 2 (attached), confirm the continuity of the gold mineralization, both along strike and down-dip, within the West Zone and demonstrate the potential for the discovery of additional gold mineralization north of the limits of the existing resource estimate (Andina September 18, 2006 release). The first results from the infill drilling program successfully demonstrated the excellent continuity of the West Zone gold mineralization between sections 200 and 700. Reverse circulation ("RC") drill hole, ROA-604, returned 148 metres grading 1.72 grams per tonne gold ("g/t Au"), with a higher grade core of 62 metres grading 2.58 g/t Au, confirming the continued depth extension of the mineralization on section 250. The zone, which remains open to depth, is anticipated to be wider as the last 2 metre interval from the drill hole graded 2.90 g/t Au. Further, RC drill hole ROA-608 established the continuity of mineralization between sections 500 and 600, with an intercept of 162 metres grading 1.93 g/t Au starting at a depth of 4 metres. An additional hole has been drilled to confirm the down dip continuity of the mineralization cut in ROA-608. Results are pending. A single infill RC drill hole, ROA-602, collared on section 300, returned no significant results. ROA-602 was collared to test the possibility that the western branch of the West Zone, intercepted in RC hole ROA-02 (42 metres grading 0.95 g/t Au) expanded as it neared surface. The result will not have any significant negative impact. Diamond drill hole DOA-610, collared on section 850, confirmed the extension of the West Zone 150 metres north the northern limit of the existing resource, with a drill intercept of 120 metres grading 1.14 g/t Au. The intercept occurs within a broader 326 metre zone of anomalous gold mineralization extending from surface which grades 0.61 g/t Au. The potential for continued expansion of the West Zone to the north is significant and the area will be a target for extensive drilling during 2007. At the end of the Phase II program, Andina drilled a single hole, DOA-11, 550 metres north of section 850 which returned an interval of 100 metres grading 1.10 g/t Au. As anticipated, drill holes ROA-603 and ROA-607, drilled on sections 150 and 100 respectively, confirmed that the West Zone does not extend significantly south of section 200. The 9,490 hectare Volcan Gold Property is centrally located in Chile's Maricunga Gold Belt approximately 170 kilometres east of the Copiapo and 23 kilometres northeast of Kinross Gold's Refugio mine. The main focus of the extensive Phase III drill program is delineation and definition drilling in the Dorado area which hosts the existing indicated resource of 1.44 million ounces of gold (43.9 million tonnes grading 1.02 g/t Au) and inferred resource of 1.16 million ounces of gold (37.2 million tonnes grading 0.97 g/t Au). In addition to the Dorado area drilling, a number of additional exploration targets will also be tested during the Phase III program, including the Andrea Zone located in the Ojo de Agua area. Gold mineralization within the Dorado area of the Volcan Gold Property occurs within structurally controlled breccias developed within a dominantly porphyritic quartz diorite intrusive. Andina has identified main three zones of mineralization to date: the East Zone, the Central Zone and the West Zone. 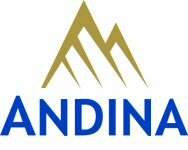 Andina is an Americas-focused exploration company, with a portfolio of precious metals exploration projects in Chile, dedicated to maximizing the value of its exploration assets through a disciplined and fiscally responsible approach to exploration. The September 2006 Volcan Gold Project resource estimate was carried out under the supervision of Michael Easdon, a Registered Professional Geologist resident in Santiago, Chile and an "Independent Qualified Person" as defined by National Instrument 43-101 Standards of Disclosure for Mineral Projects ("NI43-101"). Mr. Easdon is also the "Qualified Person" for the Volcan exploration program as defined by NI43-101. The reverse circulation ("RC") chips and diamond drill core from Andina's drill Volcan drilling campaigns were collected at the drill under the direct supervision of Andina staff. RC samples of approximately 70 kilograms in weight were collected over 2 metre intervals. Both the RC samples and drill core were appropriately tagged, secured and transported to the Andina exploration camp and then to Andina's secure sample logging and preparation site near Copiapo, Chile. RC chip samples were riffle split twice to obtain a 15 kilogram sample for assay purposes. Representative chips were collected from each sample for logging purposes. Drill core is logged, marked at two metre intervals for sampling and split longitudinally with a diamond drill saw. One half of the core is bagged and sample tags attached and the second half of the core is returned to the core boxes. All samples were appropriately tagged and securely stored prior to shipping to Asesoria Minera Geoanalitica Ltda. 's ("Geoanalitica") laboratory in La Serena, Chile. Samples are processed and analyzed for gold using fire assay techniques with atomic absorption finish. Samples which returned gold values greater than 1.00 g/t Au are re-analyzed by Geoanalitica using fire assay techniques with a gravimetric finish. Duplicate samples are inserted at a rate of approximately 5%. Andina also inserts standard samples within each sample batch to ensure laboratory quality control procedures. Occasionally Andina requests Geoanalitica send samples to ALS Chemex in La Serena, Chile for 47 trace element analysis using ICP. A 43-101 compliant Technical Report titled "Technical Report on the Volcan Gold Project. Region III, Chile" filed November 2006 at www.sedar.com summarizes Andina's September 2006 Volcan resource estimate. Previous technical reports relating to the Volcan Gold Project have also been filed on the SEDAR web site. Further, all reports are available on the Company's website noted below.